Very friendly communication, we sorted out everything in what’s up chats. We were met at the apartment for delivery of keys on a short notice. Good! Also very helpful that we were allowed a late check out the last day, as we had a late flight home. Apartment was very spacious for us (2 couples). It had everything we needed and location was also super. 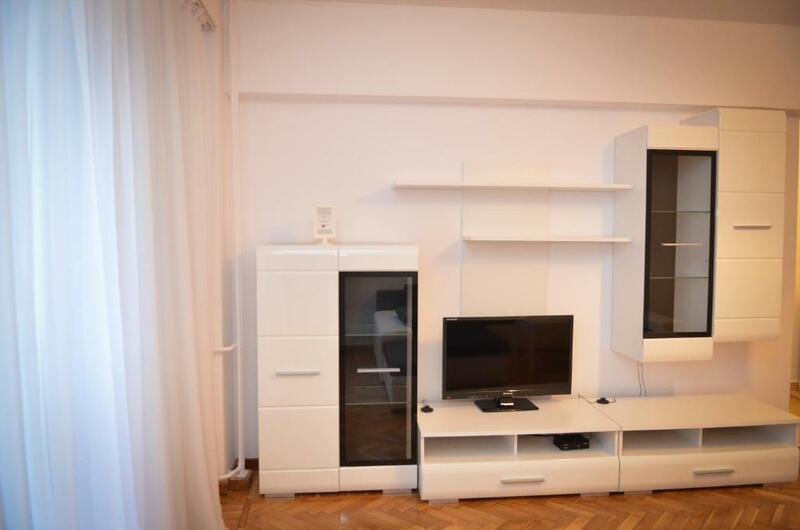 Lock in a great price for Bucharest City Center Apartment - rated 8.3 by recent guests. Located 250 yards from the metro station at Universitate in Bucharest, and featuring free WiFi access, Bucharest City Center Apartment offers self-catering accommodation. Bucharest National Theater TNB is 350 yards away. Boasting a balcony, the property comes air-conditioned, and comprises a seating area, a flat-screen TV with cable channels, as well as a washing machine. The bathroom comes with a hairdryer and free toiletries. The nearest restaurants can be found within a radius of 200 yards. The Old Town of the city is reachable within 550 yards from Bucharest City Center Apartment. The National Museum of Art is at the distance of 900 yards. The property can arrange bicycle rental and car hire. Henri Coandă Airport is located 10.3 miles away, and a shuttle transfer is available for an additional fee. Sector 4 is a great choice for travellers interested in parks, sightseeing and city walks. Bucharest City Center Apartment has been welcoming Booking.com guests since 9 Mar 2015. When would you like to stay at Bucharest City Center Apartment? We provide self-serviced apartments in the City Center. All our apartments have fully equipped kitchens, flat screen TV, free WI-FI, air conditioning, hair dryer and iron. Towels and bed sheets are included in the price. We are a full service agency that can take care of anything you need since you land in Bucharest, until you depart. We can organize your airport pick-up and drop off, help you rent a car, organize a tour in Romania (Dracula Tour, Danube Delta Tour, etc. ), help you book activities (paintball, clay shooting, karting, etc), restaurants, clubs. We can also arrange for limousine rides in and outside the city. Public parking is possible at a location nearby (reservation is not needed) and costs RON 1.63 per hour. House rules Bucharest City Center Apartment takes special requests - add in the next step! Bucharest City Center Apartment accepts these cards and reserves the right to temporarily hold an amount prior to arrival. Please let the property know your expected arrival time at least 30 minutes in advance. Contact details are stated in the booking confirmation. A damage deposit of EUR 150 is required upon arrival. That's about 129.93GBP. This deposit is fully refundable upon check out as long as there has been no damage to the property. Please inform Bucharest City Center Apartment in advance of your expected arrival time. You can use the Special Requests box when booking, or contact the property directly with the contact details provided in your confirmation. Some improvements needed to be made and Olga immediately made them. The apartment it's self is located in a good area and inside the apartment had recently been renovated but not completely finished......in fact bodged not finished properly and sharpe edges so if your staying with kids I'd avoid. The area and corridors are dark dingy and were filthy dirty and the views leave a lot to be desired and the photos on the site were nothing like we'd viewed when booking. On booking was asked if we wanted a taxi booked by our host with a deal from the airport and back again which was told would be cheaper to do and on our day to return it never showed up and we couldn't contact anyone for assistance. To be honest you'd be better just getting a taxi from the rank as was cheaper anyway. Bathrooms was unfinished leaked water everywhere. Kitchen passable facilities We was staying in a block where a group obviously on a stag party was staying to and made lots of noise and came home one evening to one lying passed out on the stairs and each night made lots of noise keeping us up. If visiting Bucharest again........to which I wouldn't I'd definitely not recommend this apartment and shop around.